Different varieties of elder tree grow in Europe (Sambucus nigra) & North America (Sambucus Canadensis). Both species are used in herbal medicine and in the food industry. The berries and flowers are used to make wines, cordials, jams and pies. The berries are high in antioxidants and are being researched as a functional food for diabetes and high cholesterol. Both the berries and flowers are used in herbal medicine to treat allergies and upper respiratory tract infections (URTI) including, colds, flus and sinusitis. Clinical trials support this traditional indication. Their phenolic compounds (flavonoids) have been shown to have an anti-adherance effect against viruses: they attach to viruses and prevent them from adhering to and infecting human cells. Extracts have reduced the severity & duration of influenza symptoms. 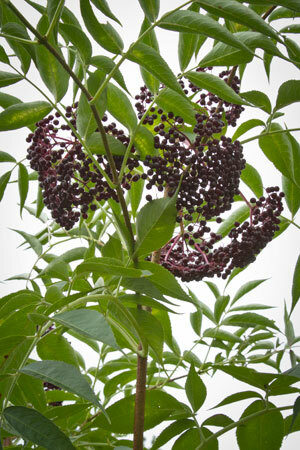 In particular, elderberry extracts are well suited for children because they usually taste sweet and fruity. Caution: The berries should be cooked to destroy the small amounts of toxic cyanogenic glycosides (sambunigrin).